Add light and rhythm to your festive parties and special events. Parading and dancing around with this LED party light up 8 inches maracas will make you a hero. Pressing the switch, will activate six different bright colorful configurations. This light up product is sold in packs of 12 and Measure 8 inches long. The light up maracas has an average of 24 hour usage if they are light up consecutively. Ideal for children s parties, island parties, and to just make some noise. 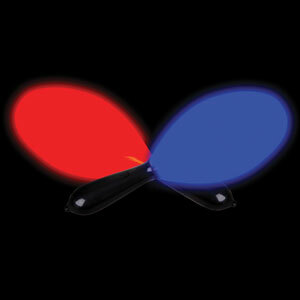 The LED party light up maracas has 3 AG13 batteries included and replaceable. These music accessories are not recommended for children under the age of 5 years old.